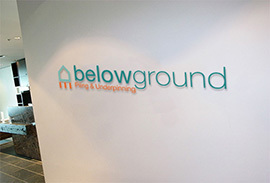 Belowground Ltd is an independent family run piling, underpinning and foundation UK contractor, benefiting from 25 years experience within the industry. Our Head Office is situated in Exeter, Devon. We also have branches in Bristol and London. We cover the entire southern part of country but are happy to travel further throughout the UK if required. Managing Director Alistair Garden established Belowground Ltd to be able to provide cost effective and value for money engineered solutions in piling, mini-piling, underpinning, house foundations and conservatory/extension bases. Our customers' needs are of paramount importance, and all schemes from small extensions through to large building sites are tailored to meet specific individual requirements whilst still providing an economical solution. We also are able to offer our work with a 12 year insurance backed warranty. The Company operates all its own plant and machinery including a modern fleet piling rigs and benefits from a directly employed skilled and experienced workforce. As an independent company we pride ourselves on customer service and will respond to your request quickly and effectively, offering friendly no obligation advice and quotations anywhere in the UK. For a professional, dedicated, cost effective, prompt and friendly service please contact us.